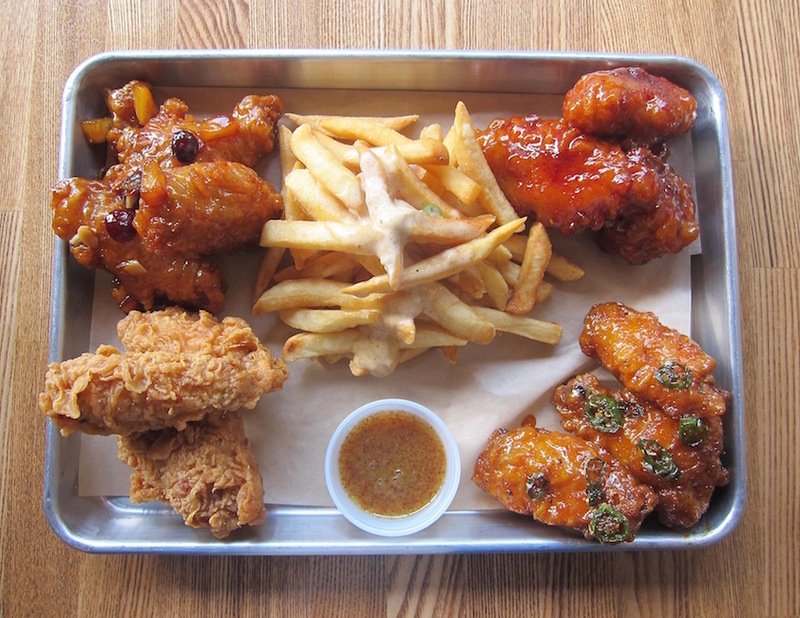 L.A.’s wing game is on point right now. 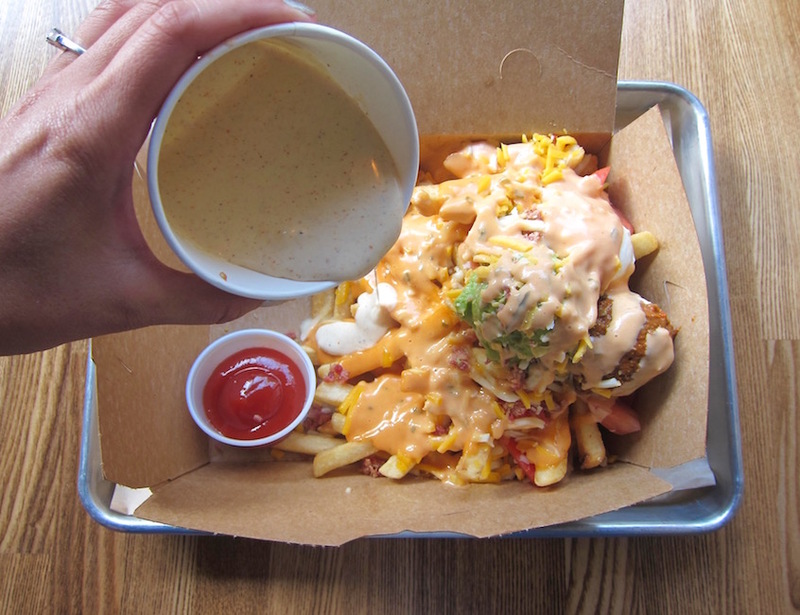 Lately, we’ve been spotting the ultimate bar snack being punched up with anything from Nashville hot shake to fish sauce caramel to Indian and Vietnamese spices. And now, a new Korean pub is taking the game to never-before-seen heights by slathering their crispy creations with sweet coconut butter, raisins, and grated cheese. Plato is your it place in Koreatown to get KFC—Korean fried chicken, not the Colonel Sanders kind. You won’t find any Double Downs on the menu (either a good or bad thing depending on where you stand on the Double Down) but you will find the crispy wings lacquered in the same kind of spicy, sweet and savory sauce that covers yangnyeom tongdak wings, aka the stuff that put local spots like KyoChon and OB Bear on the map. 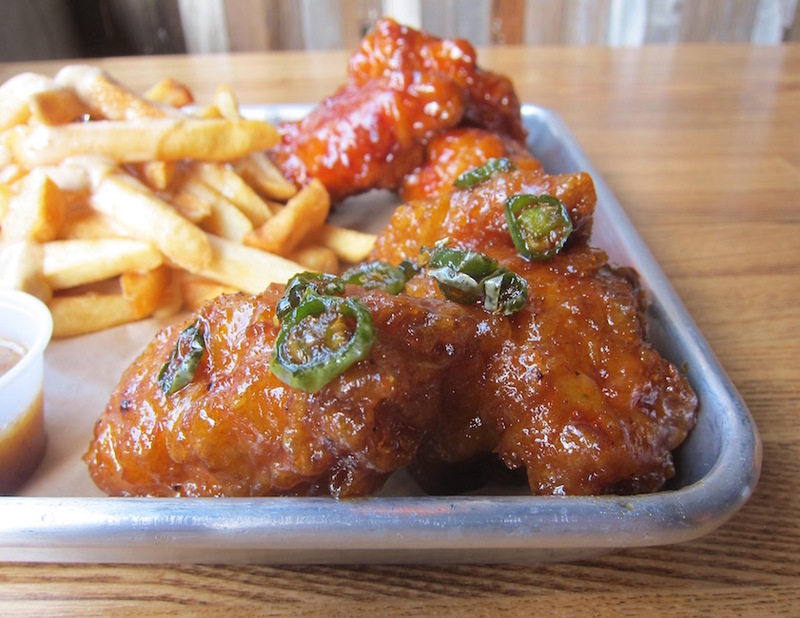 Their wings can get spicy, but the heat levels pale in comparison to what you might find elsewhere in Koreatown. You know, the kind of spice that makes you feel compelled to dunk your burning tongue into a vat of ranch dressing. For the purists, the OG Double-Fried wings are the way to go. They’re simply battered and deep-fried and served with a creamy honey mustard for you to dip at your own discretion. Most of their other wing offerings lean towards the sweet-and-savory side and you won’t find some of the tangier stuff. Oh, and none of the wings are slathered in buffalo sauce, just in case that needed to be explained. 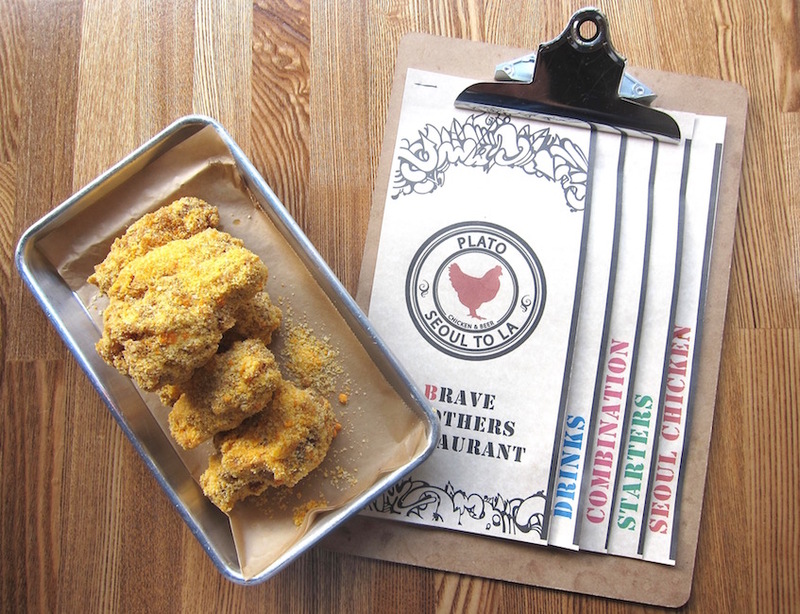 Something else you won’t find outside of Plato are the coconut butter wings (think coconut shrimp but in chicken form). 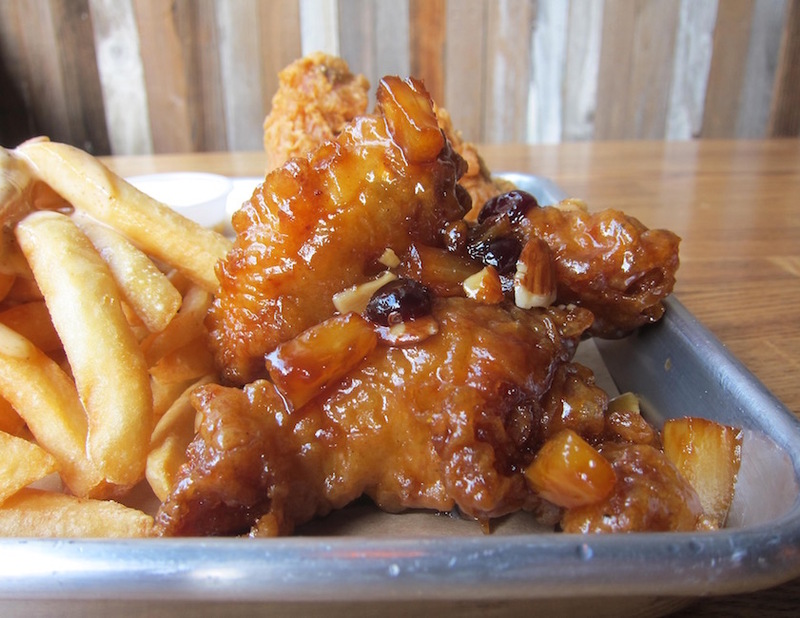 The outside of the wings are doused in a coconut oil and coconut juice reduction, caramelized, and then topped with pineapples, slivers of nuts and raisins. Another highlight is their addictive soy garlic wings, which while also sweet, are one of the more savory offerings of all their wings. These ones are accompanied by slices of serrano peppers, giving it just a little kick. While I wanted to love the Snow Chicken wings, which are densely coated in a flurry of cheddar, American and Parmesan cheese (our dairy dream team), the dry coating overpowered the succulent meat and made for a sandy texture. Sometimes you fly too close to the sun. 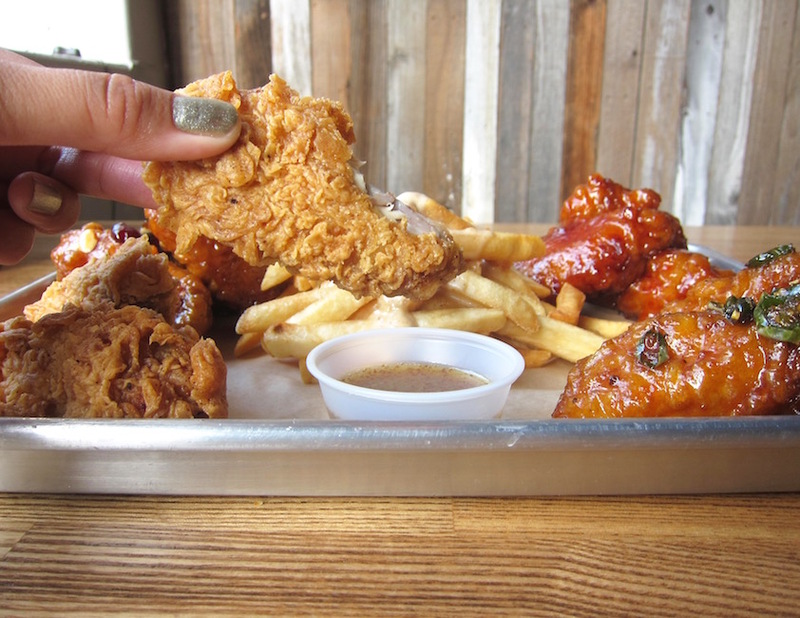 Don’t be mistaken, though: this is not just a wing joint. The duo behind Plato, Sam and Kevin Koo, dubbed themselves the “Brave Brothers”—words that are emblazoned on their pub’s windows and menus—because “we’re always trying [new things],” Sam says. The sports bar’s theme is “Seoul to L.A.” and that’s reflected in their dishes, which run the gamut of Mexican and American bar food. 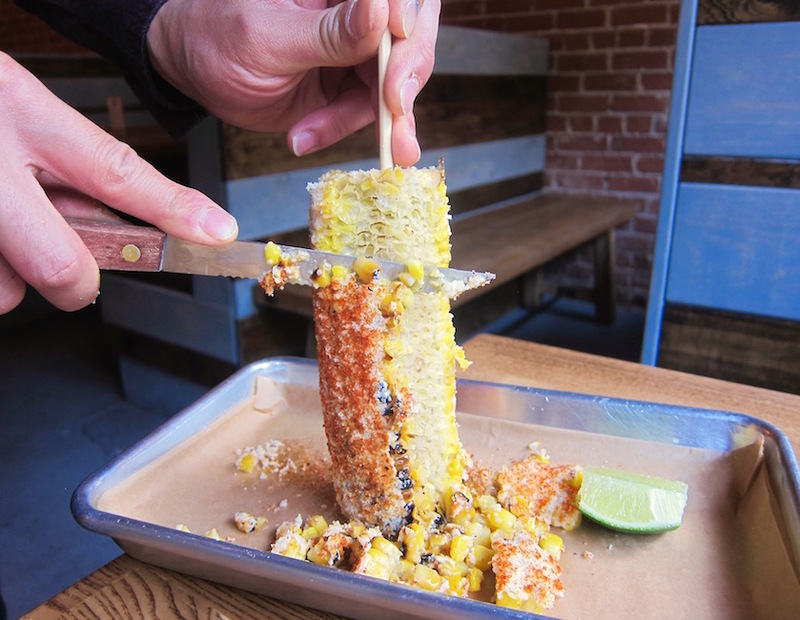 Their version of elote is your average roasted corn traditionally seasoned in the Mexican style, but instead of being served as an entire ear of corn like on the streets, Plato takes the ritzy approach of carving it table-side. Gone are the days of getting bits of corn stuck in your beard. 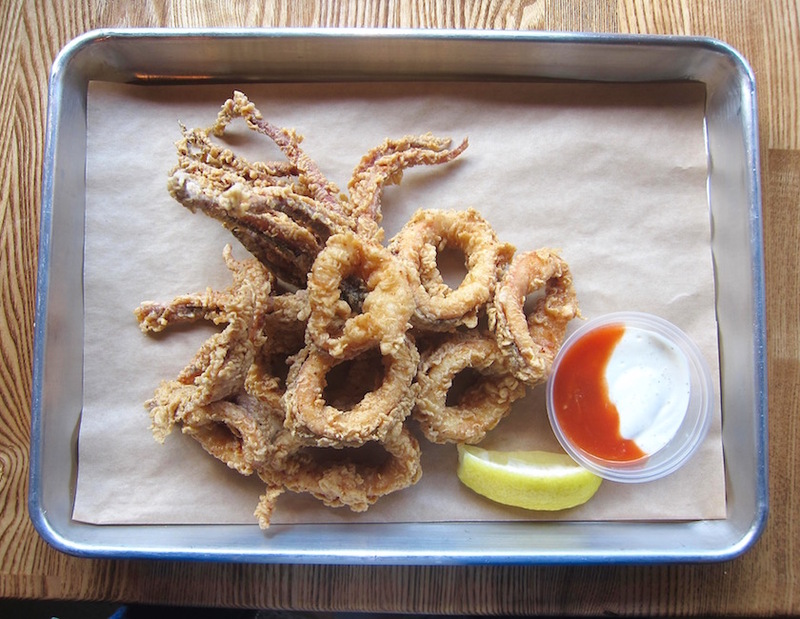 And if you’re a fan of calamari, Plato also offers up a solid version of crispy, whole deep-fried squid that’s sliced up and fanned out—tentacles and all—and paired with a simple buffalo sauce and ranch dressing. While they also whip up dishes like guacamole and chili fries served with its own sidecar of queso blanco, or clam chowder in a bread bowl from La Brea Bakery, we suggest you stick to what they do best: the wings. Plato, 3474 W 8th St., Koreatown, (213) 383-1984.